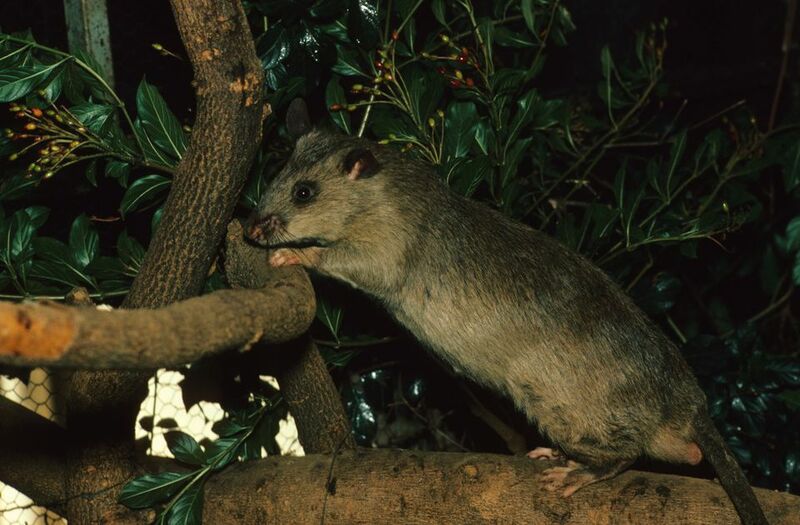 Gambian pouched rats are very large, long-lived rodents that hail from Africa. Unlike other pet rats, Gambian pouched rats have cheek pouches like hamsters, and are wild animals that grow to be the size of a small dog (about 4 pounds). Gambian rats are not particularly good pets; in fact, an escaped group formed an aggressive and invasive colony in Grassy Key, Florida, and since 2003, their sale has been banned in the United States because of a monkeypox outbreak. Today it is extremely difficult to obtain a pet Gambian pouched rat for a pet without breaking the law. Since Gambian pouched rats are relatively new to captivity they can be a bit more unpredictable than fancy rats and temperament can vary quite a bit between individuals. While they often can be good pets, there are some that remain skittish and/or become aggressive as they get older. However, with regular handling and training, most become quite friendly, gentle, and easy to handle. They are very intelligent and playful and seem to have a tendency to lick their owners, like belly rubs, and collect shiny objects and other treasures. As youngsters, Gambian pouched rats often go through a nippy stage in play much like other pet animals and need gentle training to break the habit (a firm "no" or loud "ouch" and an end to playtime if it recurs). Gambian rats will sometimes gently but firmly grasp you with their mouths (not a bite, just a hold) and try to push you away if they object to something. While some do like to be held and cuddled, others prefer not to be held (though they are still friendly). Males are quite territorial and may be more aggressive than females, particularly around the time of sexual maturity, although they often calm down again given time and patience. Unlike fancy rats, males of the species do not get along and shouldn't be housed together. If you have more than one male, wash your hands between handling them or the rats may react to the smell of the other rat on your hands with aggression. Some owners are unprepared for the destructive abilities of Gambian pouched rats. Like other rodents, they need to chew, and with their large size and teeth, they can do a lot of damage quickly if they are not supervised closely when outside of the cage for playtime. Providing a good, sturdy, large cage can be a bit of a challenge for Gambian pouched rats. Also, keep in mind that even with a large cage they will need time out of the cage daily for exercise as well as socialization. These rats can chew very destructively so close supervision is a must when they are out of the cage. Some basic cage requirements are a minimum; the more space these pets have, the better. A cage should be as large as possible; a multi-level cage is best for providing room to move (e.g. multilevel ferret or chinchilla cage). Avoid wire floors or shelves as this will hurt their feet. An all-metal cage is best as Gambian rats can quickly chew through or destroy plastic or wood. A deep base is best, or you can add a urine shield (strip of metal or plastic around the outside of the lower part of the cage). This helps keep the bedding in and prevents feces from falling out since Gambian pouched rats tend to back into a corner to defecate. Powder coated metal (or stainless steel) cage. Zinc can be ingested if chewing on galvanized cages, and their urine will discolor galvanized wire quickly. Use Aspen wood shaving or an aspen, paper, or pulp-based bedding material in the bottom of the cage, but no cedar or pine. Provide lots of plain white (no dyes or perfumes) paper towels or facial tissue for nesting material. Clean the cage thoroughly on a weekly basis. Gambian pouched rats tend to back into a corner to defecate and urinate, which makes spot cleaning the cage easy in between major cleanings. Gambian rats could potentially be litter trained by providing a corner litter box. All rats love to chew and Gambian pouched rats are no exception, and since they are larger they can chew through items very quickly. A good variety of wood chew toys should be offered to keep them occupied—large parrot toys often work well. Wooden toys made out of arbutus or manzanita wood are a little tougher so provide extra chewing time. Nylabones (in the dog section) also provide good chewing opportunities. Cotton rope toys are also a good option. Plastic toys will not last long and are a health hazard if chewed off pieces are ingested by Gambian pouched rats. An exercise wheel is also an excellent idea, but the trick is finding one. A wheel should be metal, solid surface, and large (15-inch minimum, but a 17-inch diameter is better). Remember that Gambian pouched rats are hoarders, so they are liable to pack their cheek pouches full of food and move it from the food bowl to their nest. Be careful not to overfeed and monitor their cage for uneaten decaying food. Some people recommend supplementing with a little bit of fish oil in their diet to curb dry skin problems. Keeping the humidity up in the room you keep your rat in may help too. Never feed chocolate, and avoid fried food, salty food, candy, or junk food. While it's unlikely that local exotic vet will have had experience with this particular species, any vet with experience treating rodents should be able to treat your pet pouched rat. Is It Legal to Own a Pet Gambian Pouched Rat Here? As noted, the import of Gambian pouched rats is now illegal in the United States as a result of an associated outbreak of monkeypox in 2003. According to the CDC: "A person may not import into the United States any live or dead rodent of African origin, including any rodents that were caught in Africa and then shipped directly to the United States or shipped to other countries before being imported to the United States. The ban also applies to rodents whose native habitat is in Africa, even if those rodents were born elsewhere." This species is illegal as a pet in many states, because of the potential threat to native species should these rodents be released into the wild. There are some websites that describe laws regarding owning and raising Gambian pouched rats, but it's really wisest to check with both your state and county to be sure you're following the law. Because of the legal status of Gambian pouched rats, it is extremely difficult to purchase a Gambian pouched rat. While there are some American breeders that do raise this species, most work exclusively with laboratories and other organizations and do not sell to pet owners. If you are dedicated to the idea of raising a Gambian pouched rat in the United States your best bet is to adopt one that is being given up by its owner; in that case, however, do your research to be sure the animal is healthy and tame, and that ownership is legal in your location.